A very capable flanger that makes the most of TC's TonePrint tech. Lots of flexibility from the onboard controls. TonePrint editing really opens up your options. The minute size will annoy some players. 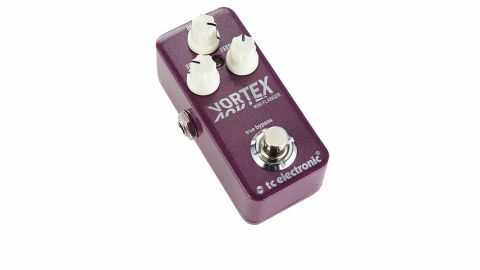 The flamboyant flanger is famed for its swirling jetplane swoosh, but it's capable of much more than that - and TC Electronic's new Vortex Mini ably demonstrates its potential. "There's a surprising amount of flexibility available from the three knobs"
There's a surprising amount of flexibility available from the three knobs, especially the feedback dial: take it out for Andy Summers-style chorus tones, or turn it up for EVH whoosh. As with all of the new Mini range, the Vortex supports TC Electronic's TonePrint technology, allowing you to wirelessly beam new presets via a iOS/Android app, plus tweak your own sounds with the PC-based TonePrint editor and USB connection. The TonePrint Editor proves extremely useful for tailoring the flanger's sweep, and the zero-through flanging tones offer almost Uni-Vibe-ish sounds.